Compact Folding and Non-Folding Metal and Wooden Cribs for Commercial Use in Hotels and Resorts, Daycares and more - Consumers can also purchase these Products. These Cribs are convenient from a storage and set up standpoint for Hotels and Resorts yet offer parents with the comfort of providing a solid crib for sleeping children. Our crib line is also available for Daycares, Hospitals and Children's Nursery Centers as well as in home use. See Price List or individual descriptions for Cribs available in the US and Canada. Cribs include mattress as indicated. PLEASE NOTE THAT WE NO LONGER SELL DROP SIDE CRIBS IN THE UNITED STATES OR CANADA. While the new regulations are not yet in place in Canada - we have taken a pro-active stance on this issue. All Compact Cribs come with mattress as indicated. Click here for Full-Size Metal and Wood Folding and Non-Folding Cribs. Size: 39.6" x 26" x 36.25"
Compact-size includes a 2" foam mattress with a sleeping surface of 24"x 38"
Can accommodate a replacement 3" mattress - purchased separately. "Through-the-Door" sizing allows this crib to fit through all standard doors in the fully assembled position. A Professional Series™ ultra durable antimicrobial mattress provides superior comfort and is included with every HideAway™ that is compliant with CFR 1633 fire standards. Recommended for use for children up to 35" tall. The ultimate in steel folding crib convenience styling, and quality. Available in most popular compact-size as well as full-size for extended stay properties. Compact cribs include a 4" mattress with a 24" x 38" sleeping surface. Mattress is available in foam and innerspring configurations. Constructed of heavy-duty steel utilizing a 360 degree welding process to provide long-lasting strength. The non-porous, easy to clean, powder coated finish resists corrosion and scratches. Features reinforced locking floorboards and oversized locking casters made of non-marking material for easy transport over any surface. A Professional Series™ ultra durable antimicrobial mattress provides superior comfort and is included with every Pinnacle™ crib. Cribs arrive fully assembled and can fold flat in seconds for easy storage. Full one year warranty. Instructions are permanently affixed to avoid loss and are in english/french for Canada. This crib is a/vailable to our Canadian Customers. Size: 40" X 28" X 43"
Folds flat in seconds with stable footprint to avoid tipping when folded. SafetyCraft® cribs are an extraordinary value, offering good quality to the cost conscious customer. SafetyCraft® ensures that you do not have to sacrifice safety for affordability. Teething rail included for the protection of children and the longevity of the crib. Mortise and tenon construction headboard provides added strength. Mattress board adjust to two heights. Nonmarking, ultraquiet commercial casters (two locking). Lower profile allows easier accessibility to infant. SafeSupport™ solid steel frame provides unprecedented strength. 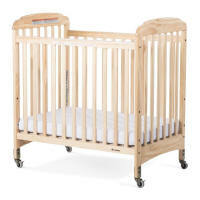 Crib has full 5 year warranty, with lifetime warranty on frame, casters, and hardware. Designed exclusively for daycare use. Available with non-distorting acrylic panels on both ends allow baby a clear view of its surroundings or slatted ends. Sleeping surface is 24" x 38" and recommended for use with children up to 35" tall - included 3" thick foam mattress. Meets or exceeds all CPSC, JPMA/ASTM and Canadian (where applicable) Crib Standards and are compliant with California fire standards. Instructions are permanently affixed to avoid loss and are printed in French/English for Canadian customers. Matching Diaper Changing Table and Wall Mounted Diaper Storage Available. Size: 39.13" x 26.25" x 40"
Teething rail included for the protection of children and the longevity of the crib. Mortise and tenon construction headboard provides added strength. Mattress board adjust to two heights. Nonmarking, ultraquiet commercial casters (two locking). Lower profile allows easier accessibility to infant. Designed exclusively for daycare use. Available with non-distorting acrylic panels on both ends allow baby a clear view of its surroundings or slatted ends. Included 3" thick foam mattress. 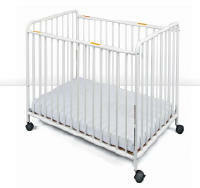 Crib has full 5 year warranty, with lifetime warranty on frame, casters, and hardware. Next Generation Serenity Compact Fixed Side Cribs are available with Slatted and Clear Ends. The number 1 Compact Crib for child care facilities was upgraded with advanced engineering to become the Next Generation of day care cribs. Advanced teething rail offers extra strength and durability. Advanced casters have two bolts for extra strength. Mortise and tenon construction headboard provides added strength. Mattress board adjust to two heights. Nonmarking, ultraquiet commercial casters (two locking). Lower profile allows easier accessibility to infant. SafeSupport™ solid steel frame provides unprecedented strength. Includes 3" ultradurable Infapure™ mattress. 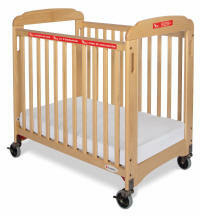 Converts to Evacuation Crib with First Responder® 4" Evacuation Casters. Color coordinated finishes are matched with hardware and casters for added beauty. 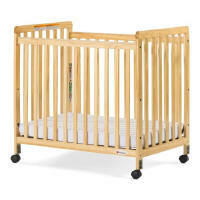 Five-year warranty on crib with lifetime warranty on steel frame, casters, and hardware. Sleeping surface is 24" x 38" and recommended for use with children up to 35" tall - included 3" thick foam mattress. Meets or exceeds all CPSC, JPMA/ASTM and Canadian Crib Standards and are compliant with California fire standards. Instructions are permanently affixed to avoid loss and are printed in French/English for Canadian customers. Matching Diaper Changing Table and Wall Mounted Diaper Storage Available. Available with Slatted or Clearview ends. Advanced teething rail offers extra strength and durability. Advanced casters have two bolts for extra strength. Includes 3" ultradurable Infapure™ mattress. 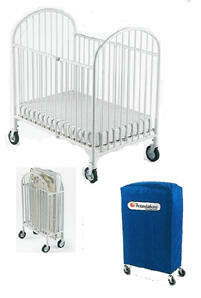 Converts to Evacuation Crib with First Responder® 4" Evacuation Casters. 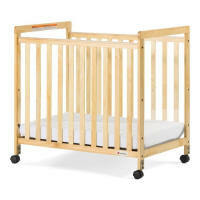 Five-year warranty on crib with lifetime warranty on steel frame, casters, and hardware. The Next Generation Serenity SafeReach Compact Crib features the revolutionary new SafeReach™ system enables caregivers to lower the side rail to access infant while minimizing the risk of back strain. The innovative SafeReach™ hinging and latching system eliminates pinch point hazards to infant. Extra quiet operation will not disturb sleeping child. Color coordinated finishes are matched with hardware and casters for added beauty. High-quality construction includes mortise and tenon joinery and high strength fasteners for superior durability. Solid steel SafeSupport™ crib frame has a lifetime warranty. Smooth plastic teething rails protect child and crib, while making it easy to sanitize. Crib has full 5 year warranty, with lifetime warranty on frame, casters, and hardware. Includes Professional Series™ 3" ultradurable antimicrobial mattress. 2" nonmarking, ultraquiet casters. Designed exclusively for daycare use. Available with non-distorting acrylic panels on both ends allow baby a clear view of its surroundings or a non-distorting mirror panel at one end for baby to interact with its own reflection. Sleeping surface is 24" x 38" and recommended for use with children up to 35" tall - included 3" thick foam mattress. Meets or exceeds all CPSC, JPMA/ASTM and Canadian (where applicable) Crib Standards and are compliant with California fire standards. Instructions are permanently affixed to avoid loss and are printed in French/English for Canadian customers. Matching Diaper Changing Table and Wall Mounted Diaper Storage Available. SafeReach™ hinging and latching system eliminates pinch point hazards to infant. evacuation route. Fixed-side cribs feature a lower profile, providing easier accessibility to infant while reducing back strain for caregiver. Color coordinated finishes are matched with hardware and casters for added beauty. High-quality construction includes mortise and tenon joinery and high strength fasteners for superior durability. Solid steel SafeSupport™ crib frame has a lifetime warranty. Smooth plastic teething rails protect child and crib, while making it easy to sanitize. Crib has full 5 year warranty, with lifetime warranty on frame, casters, and hardware. Includes Professional Series™ 3" ultradurable antimicrobial mattress. Designed exclusively for daycare use. Non-distorting acrylic panels on both ends allow baby a clear view of its surroundings. Sleeping surface is 24" x 38" and recommended for use with children up to 35" tall - included 3" thick foam mattress. Meets or exceeds all CPSC, JPMA/ASTM and Canadian Crib Standards and are compliant with California fire standards. Instructions are permanently affixed to avoid loss and are printed in English and French. Five year warranty.. These Cribs are available for Canadian Customers. Size: 39.33" x 26.25" x 40"
Click here for Evacuation Kit. Easy Grip Handles are integrated into headboards to assist caregivers in stable transport. Exclusive Evacuation Icons clearly identify crib for evacuation use visible from all sides for immediate recognition by first responders. Solid Steel Gussets bridge caster brackets directly to the solid steel SafeSupport™ crib frame to provide the ultimate in strength and durability. Casters 4" durable nonmarking casters (2 braking) enable crib to maneuver evacuation route. Fixed-side cribs feature a lower profile, providing easier accessibility to infant while reducing back strain for caregiver. Evacuation Guide for Safe methods to prepare for successful evacuation. Glow-in-the-dark signs guide personnel to the nearest exit. The Chelsea crib provides safety, durability, and convenience at a great value. Constructed of heavy-duty steel with a powder coated finish that resists corrosion and scratches and is easy to clean. Mattress board adjusts to two heights for easy access to infant and so crib may be used as a bassinet. Comes with 4" casters, two locking and two non-locking. Cribs meet CPSC, ASTM, JPMA and Canadian crib safety standards. All instructions are printed in English, Spanish, and French and are permanently affixed to avoid loss. 3" high density foam mattress that meets the new Flammability Standard CFR 1633 is included. Full one year warranty included. Size: 40.5" x 26" x 37"
Some Products not available in Canada. Discounts for multiple orders. Contact us for customized service. These Products are UPS Shippable - Multiple orders ship via freight.